Your immune system is your body’s defence against infection. It protects you from bacteria, viruses, and other germs that can make you sick. It includes your skin, lymphatic system (which is made up of your lymph glands, Peyer's patches, thymus, and spleen) and white blood cells (which are made in your bone marrow). 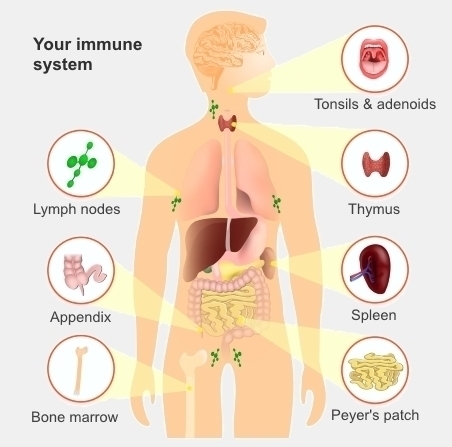 The illustration shows some of the different parts of your body involved in your immune system. Each part of your immune system has a different role. Some parts stop bugs entering your body, for example your skin acts as a barrier and your stomach acid kills bugs from your food. If bugs do get into your body, other parts of your immune system, such as your white blood cells, act like an army to fight them. Immunosuppression and immunocompromise are the names for what happens when your immune system is weak. People can have weak immune systems for many reasons. In the first few weeks of its life, a newborn baby has an immature immune system. Also, as a normal part of ageing your immune system gets less efficient. Some conditions such as diabetes, certain cancers (lymphoma, leukaemia, and myeloma), and HIV cause a weak immune system. Sometimes it is caused by the medicines you take, which specifically affect your immune system. These include the medicines people take after an organ transplant to stop their immune system from attacking, or rejecting, the new organ. Another example is medicines that treat auto-immune conditions such as rheumatoid arthritis, inflammatory bowel disease, and psoriasis. These medicines are called immunosuppressants. Immunosuppression can also be an unwanted side effect of a medicine, for example chemotherapy fights cancer, but it also weakens your immune system. Any medicine or condition that weakens your immune system also increases your risk of getting an infection. Your doctor will tell you if the medicine you're taking could affect your immune system and what precautions you need to take. You can look up your medicine in the A-Z of medication factsheets. The following page is about self-care for immunosuppression caused by medicines that suppress your immunity. Cancer Research UK – Immunisations and chemotherapy, retrieved November 2016. Diabetes In Control – Diabetes mellitus and infectious diseases: controlling chronic hyperglycemia, retrieved October 2016. Patient – The immune system, retrieved October 2016.